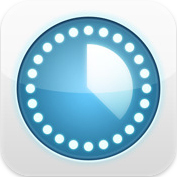 Billings Touch iPhone App Review. Marketcircle has recently released Billings Touch for your iPhone to accompany their already top-notch invoicing software Billings (on the MAC). 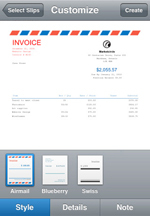 For those that don't know what it is, Billings is a professional time billing and invoicing software available on the MAC. It allows you to track time you spend on projects via a convenient menubar timer, that won't interfere with any of your running applications. You can send fully customizable invoices to clients at the click of a button, and even schedule recurring invoices for clients you bill for the same services every month. For you busy folks out there, Billings will automatically alert you whenever a client fails to pay an invoice, so you never let one fall through the cracks. On the iPhone, Billings Touch will complement and add new features to the popular desktop software, and also allow you to sync the two. 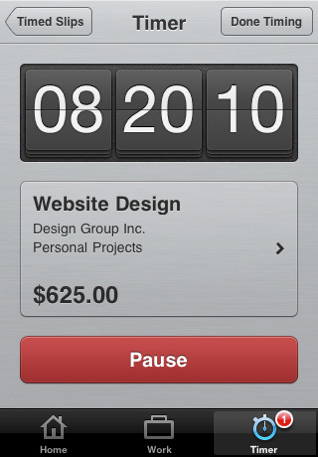 You'll be able to create clients, add new projects and track time easily when you're mobile and away from the desktop. 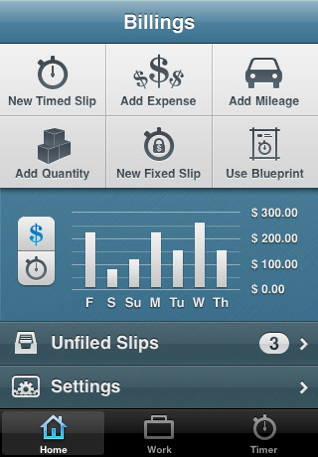 You can also track mileage, expenses and client payments. When you first start up Billings on your iPhone, you are presented with two options. If you already use Billings on your MAC, you can choose to use that account and sync the two devices instantly. Your iPhone becomes a logical extension for your MAC when using Billings. On the other hand, you can choose to start Billings from scratch, if you don't have it on your MAC yet. The app will take you through the usual steps with creating a new account, and you have to provide it with your name and address, tax information and set your hourly rates. Billings has a wide support for localization, so after you're taken through the Taxes process and select the country you're in, you'll be able to use that country's currency to set rates, add mileage and expenses, and so on. Once you've gone through the basic set up process, you can start creating clients, adding projects and tracking time for these projects. Each of the options are carefully linked to each other, so tracking time won't be possible unless creating a new project to track time for. That project is linked to a client, who you can easily invoice based on the time tracked with Billings. The first thing you'll want to do is create a new client and enter its credentials and billing information. Adding a client is intuitive. You can either pull information from your Contacts or type in a new client information sheet. Once you have that, creating and sending invoices is an easy process, no matter where you happen to be. 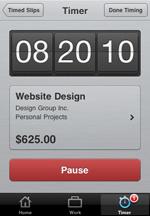 You can then begin to track your time spent on a client by creating a new timed slip. The timer will run even when the app is closed, which is one neat feature, considering that the iPhone doesn't allow multitasking, officially. To stop a timer, hit Stop and the time will be added in the specific client's account. 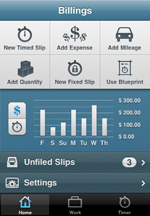 Billings Touch will also let you handle a variety of invoicing tasks, like adding expenses or mileage. 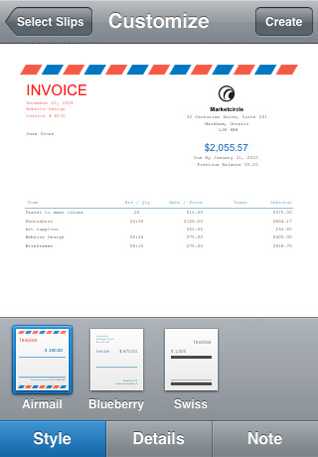 Put it all together and send the client an invoice right from your iPhone, via email. If you're careful and mark payments you receive, Billings Touch will do some basic bookkeeping for you. This way, you'll be on top of the situation at all times, having an overview over who's late and who's coming up. Even when you're mobile, you'll still have a pretty good idea of how your business is doing. Just like in the MAC version, Billings Touch ported the "Blueprints" functionality for the iPhone. Blueprints are essentially presets for your work slips, where you can define the title of a task, the rate and all information that will just take precious time to type again and again. You can use these blueprints to make new slips on the fly. That's precious time Billings Touch is saving you, since most probably you can't really bill the billing process itself. While Billings Touch is a free app to download in the AppStore, you will be missing two important elements that won't come straight out of the box: syncing with the desktop version and sending invoices via email to clients. Both of these features are available as In-App Purchases for the price tag of $15. That's a fairly high price for Billings Touch the complete solution, but that's a price I'm willing to pay for a competitive application that will easily make me the 15 bucks I'm spending in no time. Billings for MAC remains priced at a competitive $39.99. But considering that it's not completely necessary to run the iPhone app, you can go without it until your business grows exponentially. Billings doesn't offer an option to bill a client per project though, so you will have to manage either with just hourly rates or do some basic Math to bill a project for a certain amount of hours. On the whole, Billings for the iPhone I believe is aimed at freelancers that need an easy solution they can use even when mobile. There will always be a dispute amongst freelancers as to hourly vs. project billing, either way, Billings Touch is a great way to manage your finances and projects. If you're in the freelance business, tracking time is an important task. So put away the pen and paper, and go with a complete solution that will let you get things done and give you some peace of mind when it comes to billings and time tracking. What do you think of Billings Touch ? Scroll down for our comment section and let us know! The App That Lets You Fill Out Forms. Paperless!